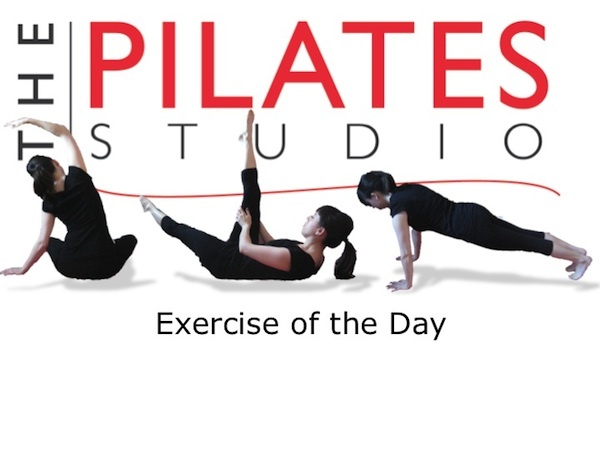 This Exercise adds an incredible challenge to the Pilates classic The Hundred. The magic circle adds additional weight to the lever arm of the long legs. To do this exercise you will need a mat and a magic circle. Start by lying on your back with your legs in the air. Once you place the magic circle between your ankles straighten your legs so that they are directly above your hips. Then inhale into the back of the ribs and exhale as you reach your fingertips past your hips. Keep exhaling as you press your ribcage into the ground to lift your head, neck, and shoulders into the air. Continue pumping your arms as you engage in 10 cycles of the sniffing breaths. Five pumps for the inhale and five pumps for the exhale. Once you have completed this cycle then bend your knees and lower your head to the ground. If you have osteoporosis you should do this exercise with your head, neck, and shoulders on the ground. This will challenge the lower abdominals as you lower the legs. Be sure not to feel any tension in your low back. If you feel tension in the back of your neck you, then you might not be getting all of the air out of your lungs. Be sure to exhale completely, which will allow you to press your ribcage farther into the ground. To challenge yourself further feel free to lower your legs towards the ground. Be sure that you continue to press the magic circle towards the center and as you lower your legs your lower abs should be engaged even more to avoid hip flexor engagement.